Cloud services can simplify your digital life, and most of them offer free options. If you don’t enjoy installing and maintaining software, or you’re sometimes frustrated that the information you want is only available on the computer back at your home or office, then you’ll benefit by using the cloud. What can the cloud do for you? How about access to your email or music collection from ANY computer or mobile device? Or creating documents and spreadsheets, without having to buy expensive “office” software? Wouldn’t you like to have all your documents at your fingertips, and be certain they’re backed up and safe from fire, flood, viruses and hard drive crashes? Email was one of the first big things to migrate to the cloud. Instead of managing your email with software that’s tied to one specific computer, all you need now is a Web browser. Google’s Gmail, Hotmail (now Outlook.com), and Yahoo Mail are three major names in this Webmail game. All but the puniest ISPs provide some sort of Webmail interface to their email servers. See my article Why You Should Dump Outlook for a list of the benefits that webmail offers over desktop email software. When it comes to work, there are several cloud-based office productivity services available. The best known one is probably Google Docs, followed by Microsoft Office 365. Zoho is another major player. These cloud services let you create Office-compatible word processor, spreadsheet, and presentation documents. You can access them from anywhere, and collaborate on them with colleagues. Music is migrating to the cloud, making your favorite tunes available for listening on computers, phones, Internet jukeboxes, and home entertainment centers. What music lover doesn’t have iTunes, Pandora, Google Play, Amazon Cloud Player, or some other streaming music service based in the cloud? Music services sell you one song at a time instead of making you buy a whole album. You don’t need CD towers to store your tunes, specialized music players, or bulky carrying cases to take them with you. See Amazon Cloud Player for more info about cloud-based music services. Cloud-based storage space is a more generalized amenity. It’s like having a briefcase that you don’t have to carry around, which contains things you might need wherever you are. Oh, and you can give your friends and coworkers access to specific files in your cloud storage, or to entire folders. Examples of cloud storage services include Dropbox, Apple iDrive, Google Drive, Amazon Cloud Drive, and Microsoft SkyDrive. Learn more about these options in Skydrive, Google Drive, or Dropbox – Which Cloud Storage is Best? 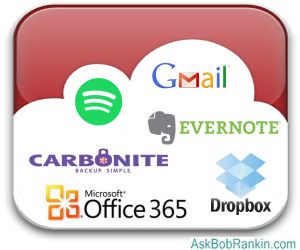 Then followup with Nine Free Cloud Backup Services to learn how you can access over 150 GB of free online storage. Backup files are obvious candidates for cloud storage. Having a backup on an external hard drive is good, but it’s even better to keep at least one set of backup files off-site, in case a natural disaster affects your home or office. Cloud-based backup services such as Carbonite, and Mozy provide software that automatically and efficiently backs up your data, and other applications that make restoring full backups or selected files easy. See Carbonite or Mozy: Which Online Backup is Best? and Free Online Backup With CrashPlan for help choosing an online backup service. Screen-sharing apps based in the cloud are a popular collaboration tool. You can display anything on your monitor to a bunch of people who may be anywhere on the Internet. Remote control of another person’s computer is also a possibility, if you’re called upon to provide tech support for family and friends. So is file transfer between users. Screen-sharing services include Crossloop, TeamViewer, LogMeIn and Mikogo. See my article Free Screen Sharing Apps for more details. Cloud-based antivirus protection is noteworthy as well. It differs from traditional locally installed internet security software in that the majority of the antivirus “engine” as well as the data analysis takes place in the cloud. This lightens the processing load on the user’s computer, and ensures that both virus definitions and the malware detection logic are never out of date. See What is Cloud-Based Antivirus? to learn about the players in cloud-based antivirus protection. The “note taking” category of cloud-based services is kind of a catch-all. Evernote, for instance, lets you easily stash text, image, audio, and other types of files; create typed notes on the fly; save bookmarks; and even send yourself notes from Twitter. Then you can access and search your notes from a variety of devices. Similar note-taking apps include Ubernote, Zoho Notebook, and Webnotes. Cloud services are popping up everywhere, replacing local storage and computing resources. However, many people still feel better having their data close and their software under their control. It’s debatable whether keeping everything on your hard drive makes you more secure. But it’s good to have choices! Do you have something to say about cloud services? Post your comment or question below. • Is Cloud Computing For Small Business? Copy.com gives a whole 15GBs of totally free storage yet you don’t mention it. By introducing someone you get another 5GBs per person for both parties. I now have 35 GBS totally free. In comparison, most only give 5free GBS and Dropbox only give 2GBs. Also you have an add for Justcloud.com which says they give 100% free storage. That is so misleading as I downloaded it and then found it doesn’t offer any free storage at all they have plans which must be paid for. EDITOR’S NOTE: Thanks for mentioning Copy.com, I was not aware of that one. As for JustCloud, I agree their ad is very misleading. I could not find anything on their site that mentioned free storage. Note that the ads on my site are automatically selected by Google or Microsoft, based on content relevancy and other factors. I can’t review or vouch for any of them. But I do appreciate reports like yours, when an ad is misleading. I’ll report this one to the ad network. SkyDrive is now OneDrive, and Microsoft only give you 5GB free. However, by using multiple account and file-sharing you can effectively have unlimited storage in 5GB blocks.